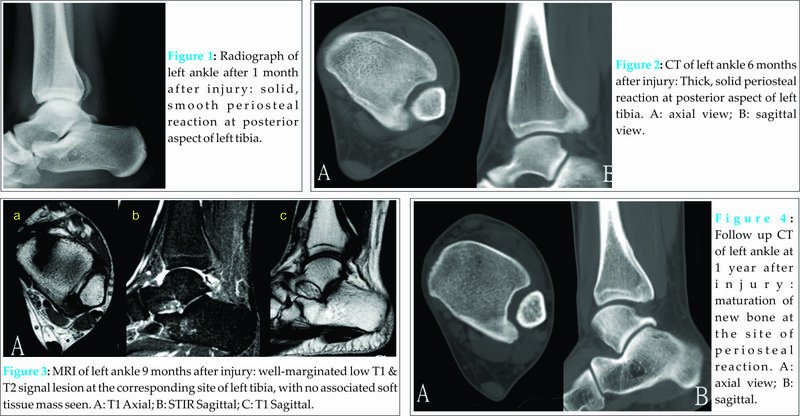 Subperiosteal haematoma of the distal tibia is one of the causes of ectopic ossification of the ankle after injury. Department of Orthopaedics and Traumatology, North District Hospital 9 Po Kin Road, Sheung Shui, NT, Hong Kong SAR, China. Introduction: Periosteal reaction has a long list of differential diagnoses ranging from trauma, infection, metabolic disease to malignancy. The morphology of periosteal reaction shown in imaging studies helps to narrow down the list of differential diagnoses. Case report: A 25 year old gentleman had an inversion injury to his left ankle. He complained of lateral ankle and posterior heel pain and swelling after the injury. Radiograph of his left ankle revealed solid, smooth periosteal reaction at posterior aspect of left distal tibia. MRI showed periosteal reaction at the corresponding site, which was better demonstrated in CT scan. Follow up MRI and CT showed maturation of the new bone formation at the site of periosteal reaction. Findings were compatible with subperiosteal hematoma formation from injury, which ossified with time. Conclusion: Smooth, thick periosteal reaction favours benign process, while interrupted pattern is an alarming feature for more aggressive causes. Keywords: subperiosteal haematoma, ankle, periosteal reaction. Periosteal reaction has a long list of differential diagnoses, which ranges from benign process e.g. trauma, infection, metabolic disease to sinister causes e.g. malignancy . Detailed history and physical examination are important keys to nail down the diagnosis. Moreover, the morphology of periosteal reaction shown in imaging studies helps to narrow down the differential list. We presented a case of subperiosteal haematoma of the ankle which was successfully diagnosed and monitored by imaging studies. Unnecessary invasive investigation and treatment e.g. excisional biopsy of the lesion was avoided. A 25 year old gentleman had an inversion injury to his left ankle. He complained of lateral ankle and posterior heel pain and swelling after the injury. He was treated by a bonesetter and the lateral ankle pain subsided but he still complained of posterior heel pain. He attended our orthopaedic clinic 5 months after the injury. The posterior heel pain had improved by that time. 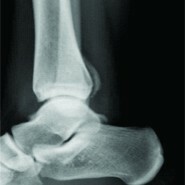 Radiograph of his left ankle revealed solid, smooth periosteal reaction at posterior aspect of left distal tibia (Fig. 1). No definite fracture was detected. MRI showed periosteal reaction at the corresponding site, which was better demonstrated in CT scan (Fig. 2). Follow up MRI at 9 months after the injury (Fig. 3) and CT at 1 year after the injury (Fig. 4) showed maturation of the new bone formation at the site of periosteal reaction. Findings are compatible with subperiosteal hematoma formation from injury, which ossified with time. The patient became asymptomatic 9 months after the injury and there was no more local tenderness or swelling. Bone repair is divided into inflammatory phase, reparative phase, and remodelling phase. In case of fracture, the periosteum is torn and hematoma is formed across the fracture site in inflammatory phase . If the periosteum is intact, hematoma will form under the periosteum . Subperiosteal haematoma of distal fibula has been reported to have a prevalence of 57.5% in children after inversion ankle sprain . The initial radiograph was normal and haematoma could be detected by ultrasound study in the initial phase . A second radiograph after two weeks may then show periosteal new bone formation over the adjacent metaphysis . The subperiosteal haematoma was believed to be associated with Salter-Harris I fractures of the distal fibula as the periosteal attachments are usually intact in children. The epiphysis can be displaced momentarily at the time of injury, but returns to its normal position when the shearing and distracting forces are removed [4,6]. This can detach the periosteum from the cortex adjacent to the growth plate and extend it proximally . In contrast, the distal tibia close to the posterior tibiofibular ligament was involved in this patient. We believed the periosteum was detached from the distal tibia together with the posterior tibiofibular ligament during the sprain injury . The ligament was healed with spontaneous reduction of the syndesmosis. On the other hand, hematoma became organized and went through the same reparative process with bone formation which gave rise to the periosteal reaction shown in the imaging studies. The differential diagnoses include parosteal osteosarcoma, osteomyelitis, subperiosteal hematoma, osteoid osteoma and hypertrophic osteoarthropathy. The smooth and solid appearance of the periosteal reaction favoured benign healing process rather than more sinister causes, which would give rise to a more interrupted pattern of periosteal reaction. With unilateral involvement and history of recent injury in a young adult, the findings were compatible with subperiosteal hematoma. Biopsy of the lesion was suggested to define the exact diagnosis but the patient refused. He was monitored regularly with clinical and radiological assessment until mature bone was formed and he became asymptomatic. Smooth, thick periosteal reaction favors benign process, while interrupted pattern is an alarming feature for more aggressive causes. The morphology of the periosteal reaction shown in imaging studies helps to narrow down the differential list. 5. Harris EJ. Epiphyseal plate injuries in paediatric ankle traumatology. J Foot Surg 1981;20:145-7. 6. Salter RB, Harris WR. Injuries involving the epiphyseal plate. J Bone Joint Surg Am 1963;45(A):587-622. 7. Lui TH, Ip KY, Chow HT. Comparison of Radiologic and Arthroscopic Diagnoses of Distal Tibiofibular Syndesmosis Disruption in Acute Ankle Fracture. Arthroscopy 2005;21:1370-1374.